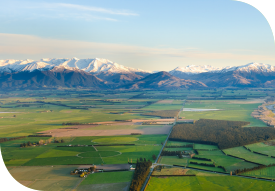 Canterbury’s rural property market is undergoing a quiet spring. At a time of year when activity would usually be at its peak, in most of the South Island, including our region, the reduced dairy payout has had an impact. Fewer farms than previous years are listed for sale, and buyers are more circumspect. Corporate owners, who have kept the Canterbury market vibrant over the past few years, are pausing to adjust to diminished returns. When it sat at $8.40, the Fonterra payout provided a compelling rationale to expand their holdings; since it has dropped, that case is less convincing. As has happened in the past, when returns are under stress, buyers and sellers engage in a stand-off. Those who might be inclined to sell dairy land are holding out for last season’s property values, while potential purchasers are either waiting for prices to drop or unwilling to commit. Some expect a rush of listings from owners under pressure and are holding back awaiting bargains. This has not eventuated so far, certainly not locally, and nor have my PGG Wrightson Real Estate colleagues elsewhere in the country reported activity of this nature. In fact, it is becoming more evident that the situation should take a turn for the better sooner rather than later. Banks are evidently providing financial support to those farmers who might be struggling with cash flow. This makes sense: If banks were to force sales, values would drop, compromising their equity, along with that of their clients. Anyone waiting for bargains to come onto the market is therefore likely to have a long wait ahead. Recent GlobalDairyTrade auctions are encouraging. If these recent price rises continue, confidence should resume, in which case, the rural property market is likely to become more active again before the end of the year. How could it not when interest rates remain so favourable? Looking at Fonterra’s proactive support for its members, and also its recently announced results, provides further grounds for optimism on dairying’s long-term future. As and when this momentum transpires, good farms will still attract interest and irrigated dairy properties, especially those with scale and modern infrastructure, will continue to hold their value. Confidence breeds confidence and it should not take long for positivity to re-emerge. Beyond the dairy sector, good red meat returns, low interest rates and the favourable kiwi dollar are aligning to motivate buyer interest in local sheep and beef farms. Although owners of these properties have been reluctant to go to the market with farms that look well below their best due to ongoing drought, as spring kicks in that is likely to change. Any breeding and finishing farm carrying 5000 stock units or more should find a ready buyer. Meanwhile, in the rest of the country, others in PGG Wrightson Real Estate’s nationwide team report that viticulture, horticulture, beef and arable farmers all have reasons to be cheerful and, in localities where these land uses dominate, their profitability will drive vibrancy in the rural property market over the rest of 2015. North Canterbury born and bred, Peter Crean is PGG Wrightson Real Estate Manager for Canterbury and the West Coast, where he leads a team of experienced local rural professionals, who have sold a number of prominent properties in recent times.